Lubbish – /lubb-ish/ adj. 1. lovely, in a fun way; full of light and love, joyful, free; 2. healed and whole. - n. 1. a person who is loved or beloved, dear one. 2. Any animal, pet, place or situation that you feel warm affection towards. Also Lubbishness. 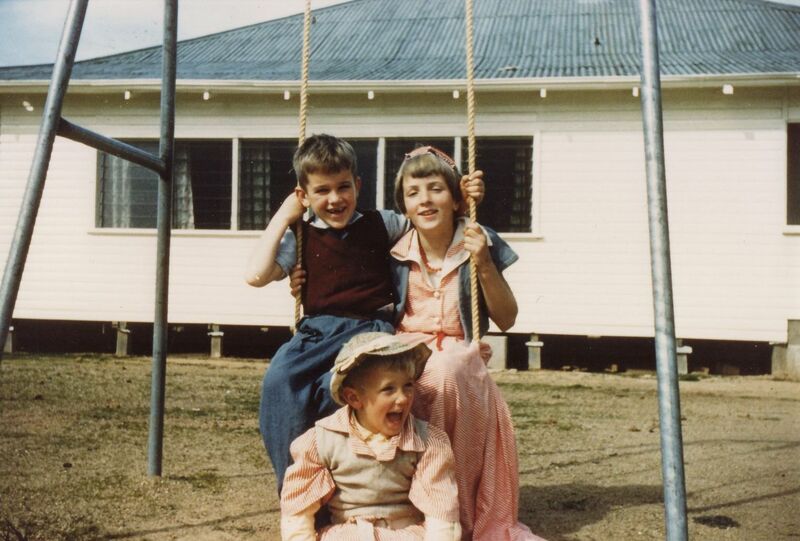 Three Lubbishes: brother Bill, sister Helen and Michael in drag, 1958. According to my older sister, Helen, I’ve been making up words and rhymes since I was a little boy. When I became a father in 1984 and ’89, I started making up words again for my kids, and Lubbish was one of them. It was easier somehow to say Lubbish than to say ‘I love you’, especially to my son as he grew up. You know there are inevitably those years when kids feel somewhat embarrassed by their parents’ love and affection, especially in public, especially at school drop-off time. I soon started calling my son Lubbish, and still do today, even though I now have to stand on tip-toes to give him a hug! Now they really won’t get it unless they read this or can intuit the meaning of Lubbish. But my research into a better domain name which was less than ten characters, unique and not already taken (or being ‘parked’ by a dealer in domain names) led me nowhere. I tried youcanheal.com but that was considered a premium name and they wanted $4,188 USD for it! Somehow I wasn’t inspired by tasreconnection.com or ausreconn.com either. I’m here for the locals, that’s true, but have also been engaged as a distance healer for people in the USA, Canada, the UK and India so I don’t want to limit my scope. Nor will I deny that over half my website visitors are American. And my given name, an invention of my protestant parents who chose to ignore the indignation of my mother's even more ‘protest-ant’ grandparents that ‘Michael is a Catholic name!,’ is too common to be a domain name. There are dozens of Michael Taylors even in my small home state of Tasmania, let alone the World Wide Web, so michaeltaylor.com is not an option. Clients sometimes ask me what I feel when I’m facilitating their healing sessions. I want to say ‘I feel love’, but especially since most of them are women I’m aware that that might not be interpreted as meant. I can’t say I feel Lubbish either but maybe they’ll read this site and get it one day. What I do say – and feel – is awake, present and very privileged. These are all qualities of Lubbishness after all. So, Lubbish it is. I hope you love it, Lubbishes.